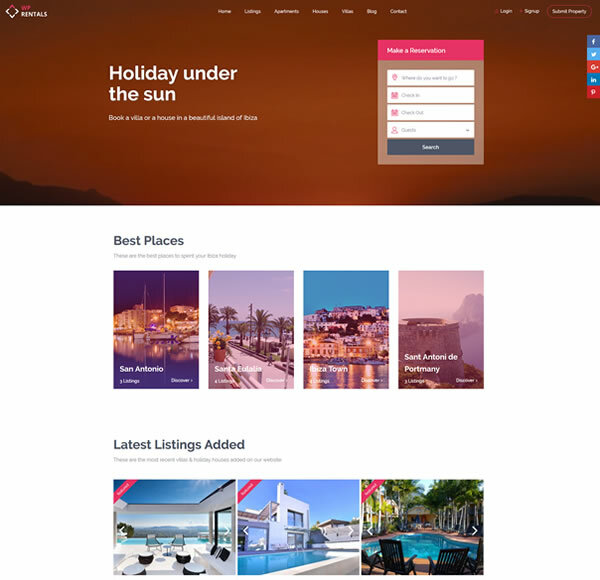 WP Rentals is a unique WordPress theme built as a booking platform for short term holiday rental. 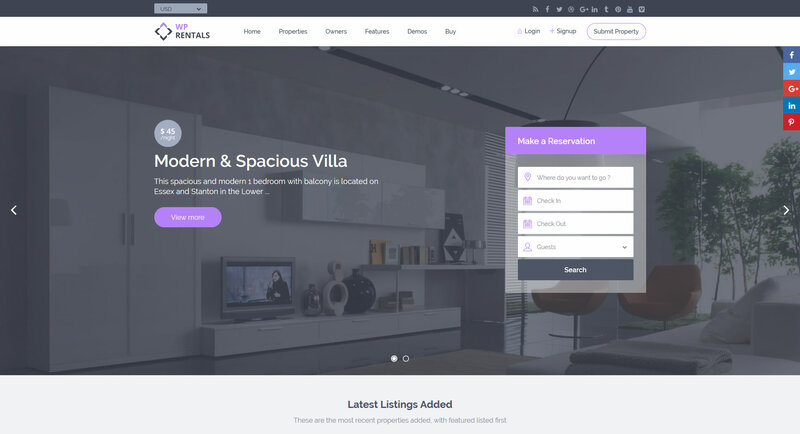 This theme allows you to publish property listings for daily rent. 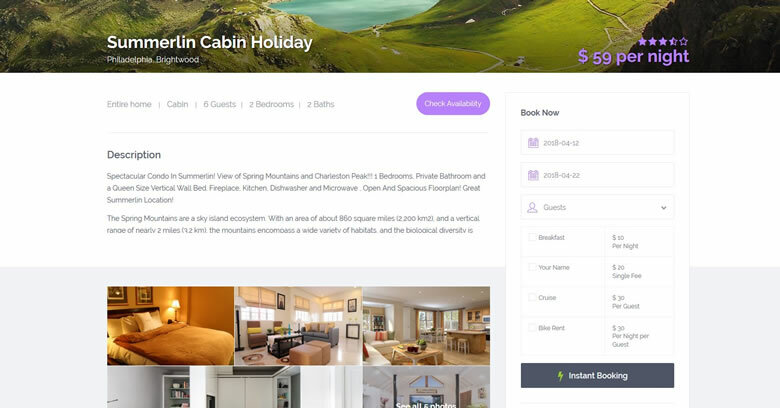 It has over 200 options and features in a custom-made booking system that comes by default with the theme. With WP Rentals you are sure to buy the right theme for your rental business. Check the available demos to see what WpRentals can do, how it works and what features it offers. The demos are customizable, and you can mix its features as desired. 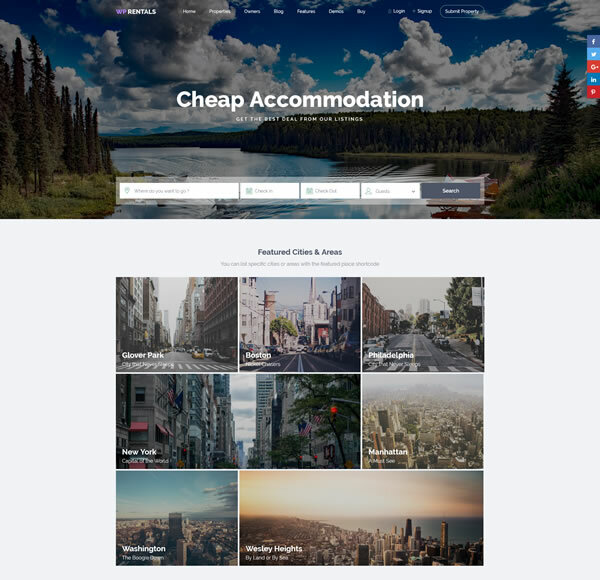 WpRentals is a theme that enables you to build your own booking website. It can adapt for different customers from individual real estate brokers or listing portal websites. It’s easy to install the available demos. Select which demos, upload it and click Import. 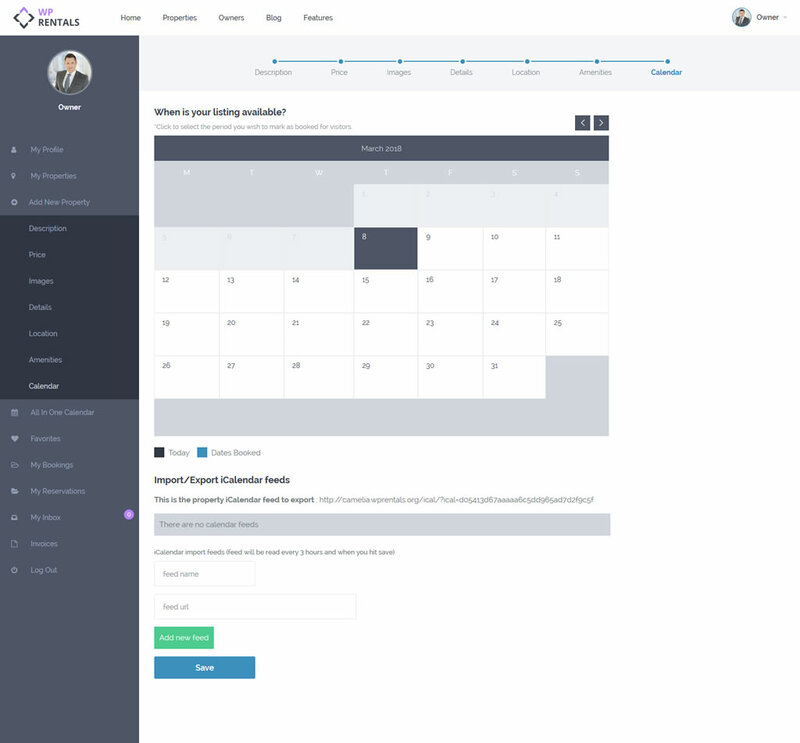 You can start editing and adding your own content in just a few seconds. 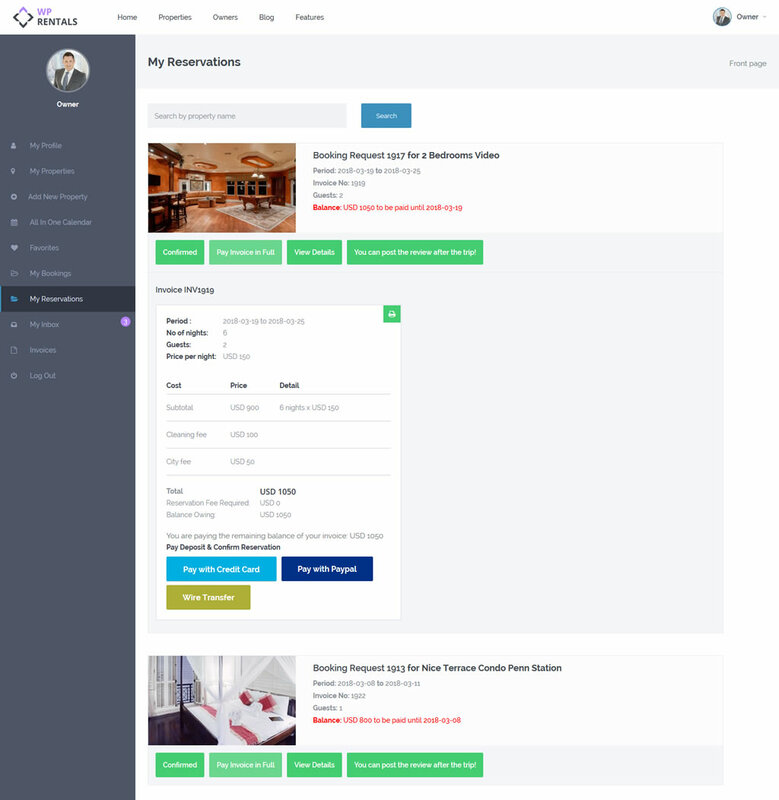 A unique booking system, with many options for managing property price, calendar, details and more. 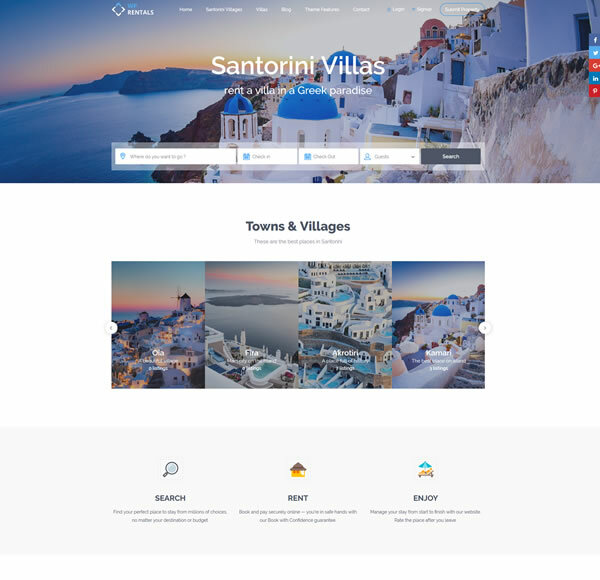 A powerful theme with a booking form for each property, which allows you select check-in and check-out dates and see the price per night info when hovering over a specific date. 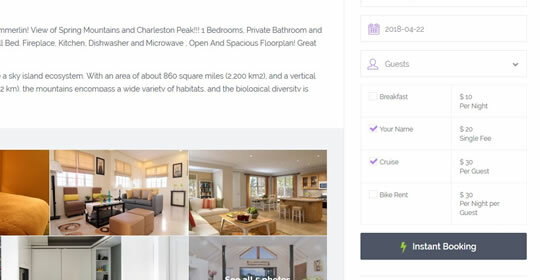 The booking form will consider the minimum number of nights (if set), the price for an extra guest (if enabled), the number of maximum guests added to the property (if no extra guests are allowed), and many more. Instant booking is enabled/disabled by each owner from the edit property form. When enabled, the system will bypass owner approval in order for a booking request to be approved. The user submitting the request may need to pay a deposit for a booking to be confirmed. In this situation, the confirmation will happen only if the payment is securely sent to admin account set for payments. From the property management area, you can select specific dates in the calendar in order to add a different price per night, a different price per guest per night, a different price per night for 7d+ or 30d+ bookings, a custom price for weekend nights, a different minimum no of days and specific turnover days. 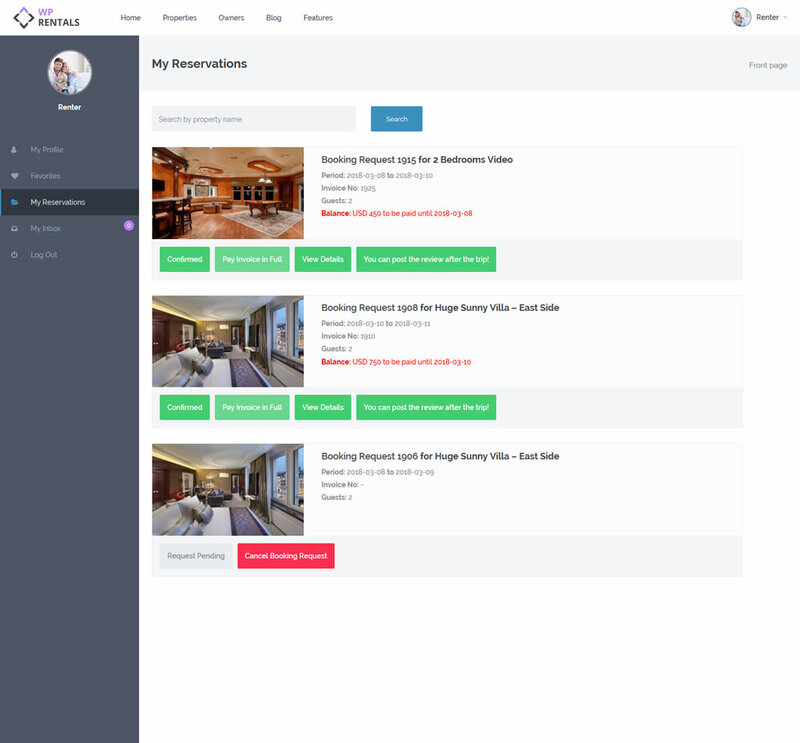 A unique feature you will not find in any other booking theme is that for each property you can add extra booking items to add in the form. You add the name of the item, the price and if the price should be per night, per guest, single fee or by night and guest. If you wish to give users a discounted price per night for bookings that are longer than 1 week or 1 month, you can set a different price per night for 7d+ and for 30d+ requests. These values can be overridden from the custom price panel for specific periods. Each property can have specific turn-over nights for check-in or for check-in and check-out. This ensures you can allow check-in & check-out dates to be only for specific days of the week. These settings can also be set just for a specific period using the custom price table system. 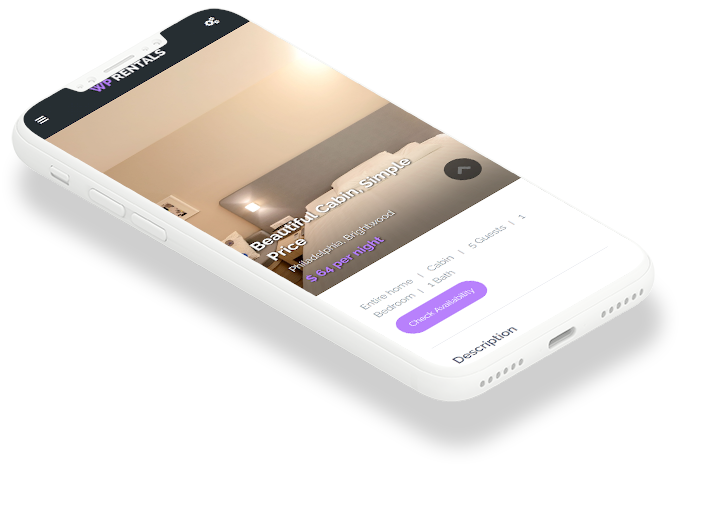 If users send booking requests for a property for a minimum number of nights in advanced, they can get an early bird discount in % which will show in the booking request form right away. This is an optional setting which can also be left blank or can be filled in at a later time. The theme allows you to set globally which are the weekend nights (3 options are available). For weekend nights you can add a specific price, and this price can be overwritten from the custom price section, in case you wish to add a custom price per night for certain dates. 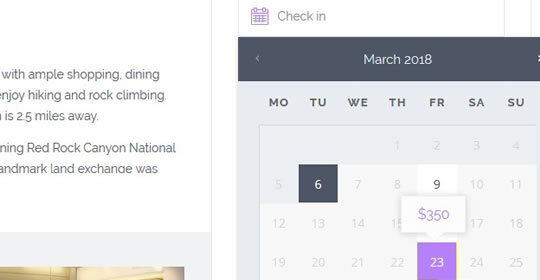 For each property, you can add a minimum number of nights for a booking, and this option forces a user to send a booking request for at least that number of days. This option can be overridden from the custom price panel, where you can add a different minimum no of nights for a specific period. Each city may have specific rules for bookings made for travel purposes, and for that reason, the theme includes a specific city fee option which can be applied as a single fee, a fee by night, a fee by guest, a fee by night and guest, or as a % from total booking value. Cleaning fee can be added to the total booking as a fixed price for total booking, as a fee per night, as a fee per guest or as a fee by night and guest. It is a choice the owner has for every property published. The fee is added to total booking (and it is excluded from admin service fee if that is enabled). Owners can add VAT tax to each rental property which is the owner’s sole responsibility to pay. The generated invoice will mark the VAT value and the total net earnings after deducted taxes and other expenses. The owner will be the only one to see these two values. In the property management area, you can choose to disregard the price per night and calculate the total booking by price per guest. Price per guest can be set globally and can be overridden for a specific booking period from the custom price section. In each property, you can set the option to allow guests over the default guest value selected, which will add to the total booking calculated by night and costs per night, the cost for each extra guest multiplied by the total of extra guests selected. Security Deposit is a special field that allows the owner to request to the user sending a booking request a certain amount as a guarantee for possible damages. This fee is sent to site admin payment account when booking is confirmed and can be refunded to the user via the theme only if admin chooses to use a specific add-on and only if the payment is done via PayPal. As admin, you have the possibility to set a large number of months to show in the booking calendar and custom price calendar, and a different number of guests to set in the guest drop-down selector when adding a property. 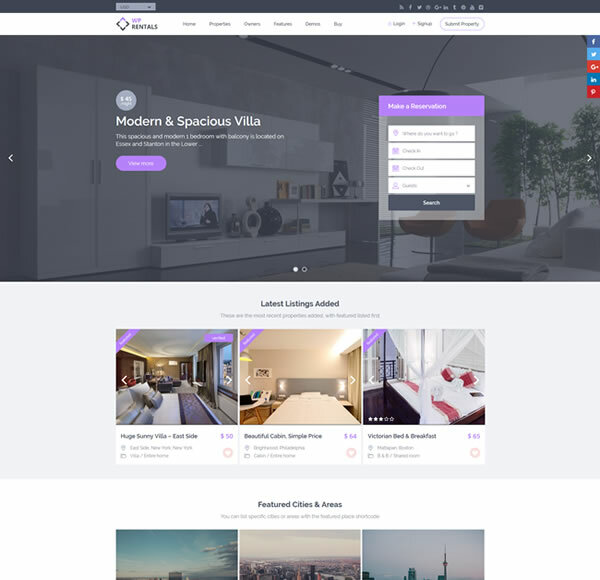 The theme comes with a dedicated search to look for properties by their availability, max guest value, and several other options. 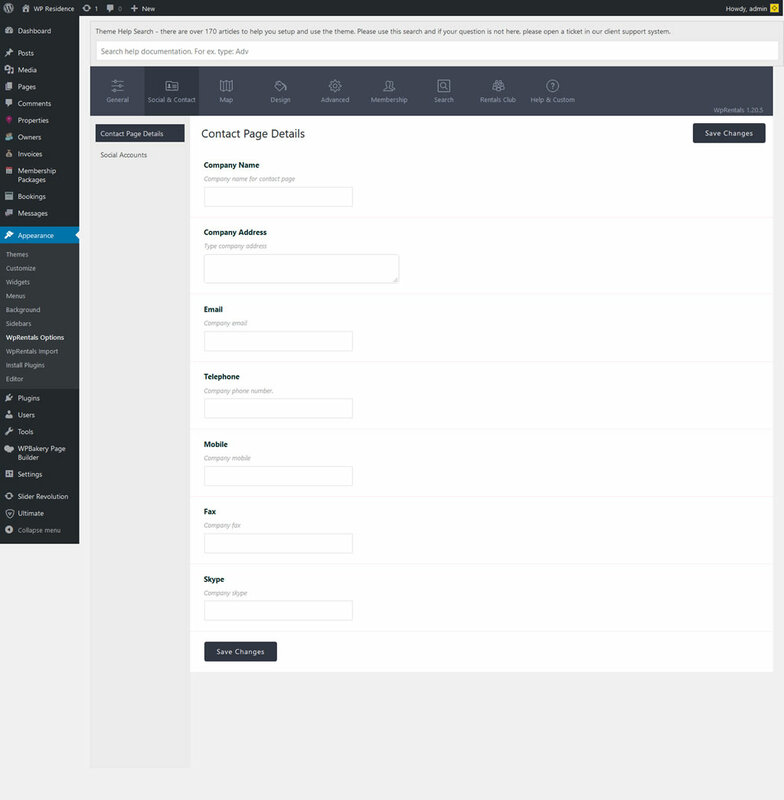 The vertical search type allows admin to design the header media in a beautiful manner, with the search box aligned on the right side of the chosen header type. The horizontal search design fits nicely on any type of header you choose (Google Maps, Rev Slider, Image or Video). It’s also an excellent design element for the splash page if you choose to use that option as well. 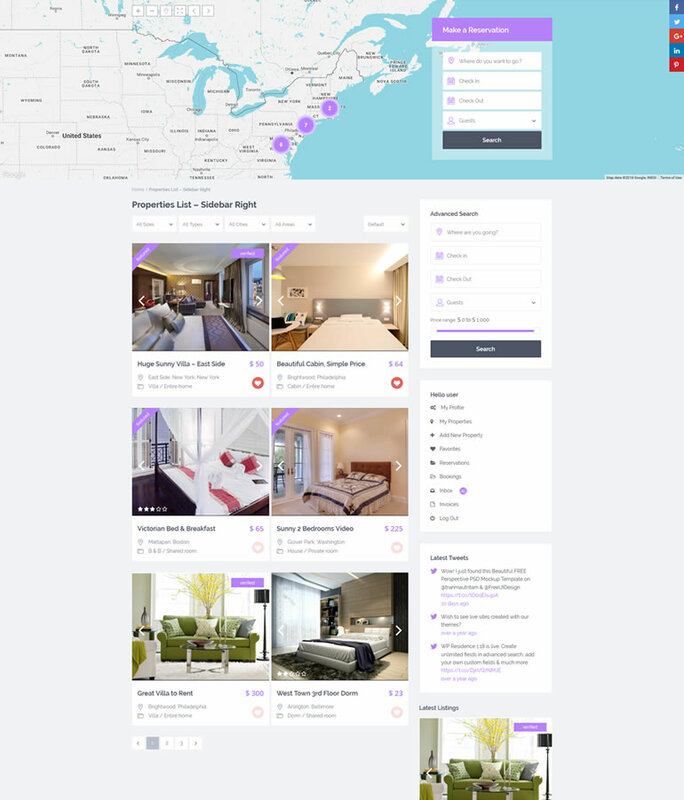 If you choose to use the Half Map style for advanced search results page, you can benefit from all the extra fields supported by this template: search by rooms, bedrooms, category, type, bathrooms, price and features and amenities. 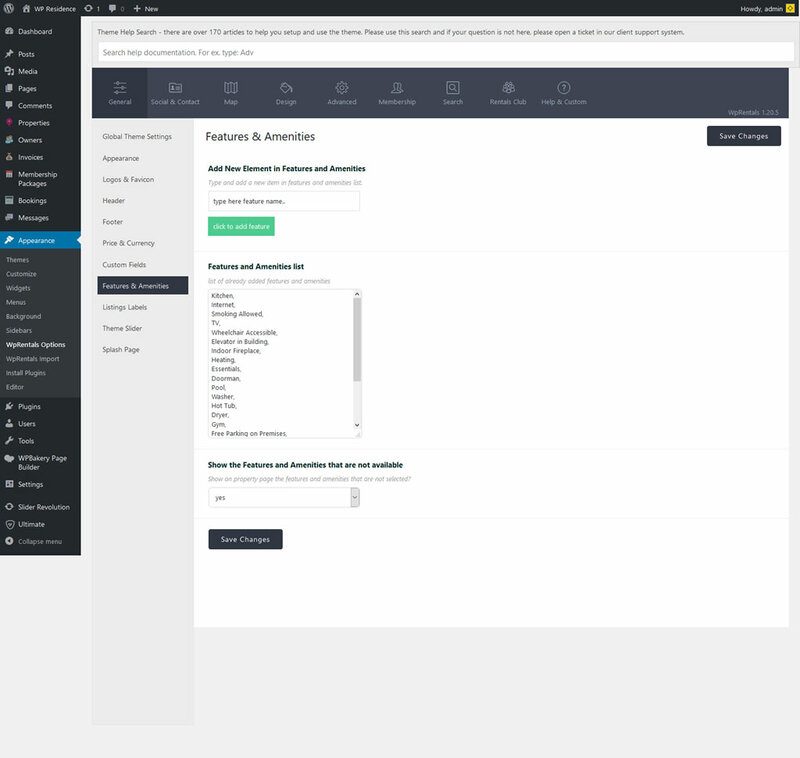 Rentals theme supports AJAX filtering over the map (and properties markers will sync as you do your search selection), as well as in the list (and properties will show as a list as you make your search selection). A very efficient system to browse and find listings. A powerful search tool is the option to enable/disable the option to see the properties in map view and in a list, all this as you move the Google Map using drag and drop, or zoom-in and zoom-out. For the location search field, you can enable the option to search using Google Places auto-complete, which finds properties by country, state, area or city using Google database. The same field is available in submit when saving property city. As an alternative to the Google Places system for location search, you can use the theme auto-complete system which works only with the countries, states, cities, and areas saved in the theme database. There is a dedicated advanced search widget which can be placed on any sidebar used in pages, properties, or blogs posts. The widgets supports location, check-in, check-out, guests and price slider fields. If you wish to use advanced search inside your pages content (not just in header) you can add a dedicated shortcode with just one click. The shortcode includes the next fields: location, check-in, check-out, guests and price slider. You can show the search results page as a half map style, with the map on the left, and search fields with the properties list on the right. This style supports additional search filters. 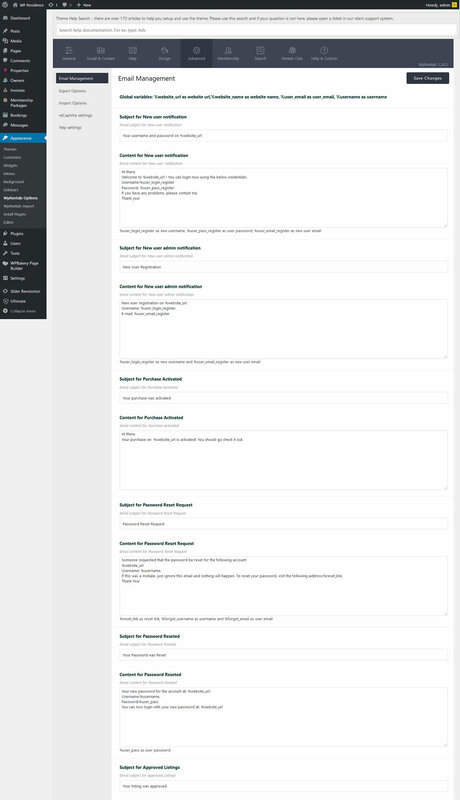 The search results page can also be a standard page, where you manage the header media (so you can have no Google Map if you wish) and the page sidebar (and you can add extra widgets if needed). You can choose to remove advanced search entirely from your website header, or you can simply show it only on pages where the header media is set to Google Map. The minimum and maxim price slider values which show on the Half Map style page, widget and shortcode, are managed directly from the admin area. 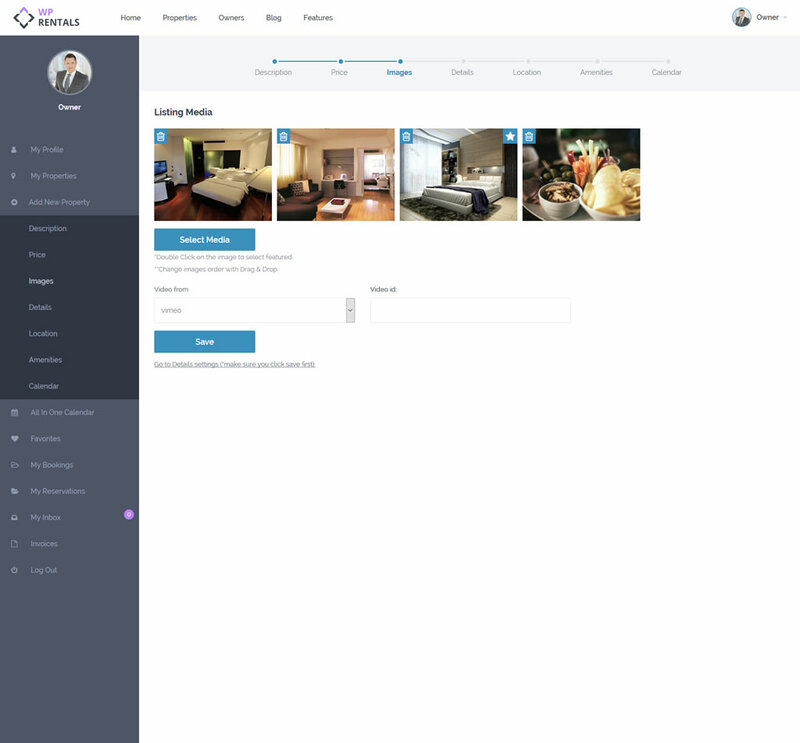 Specific features and amenities from those you add for all your listings can also be included in the theme search. They show in Half Map style page, under “More Search Options”. You can use a dedicated multi-currency widget to display the prices in different currencies (which works only for front end). This widget will sync also with the price slider min and max values. 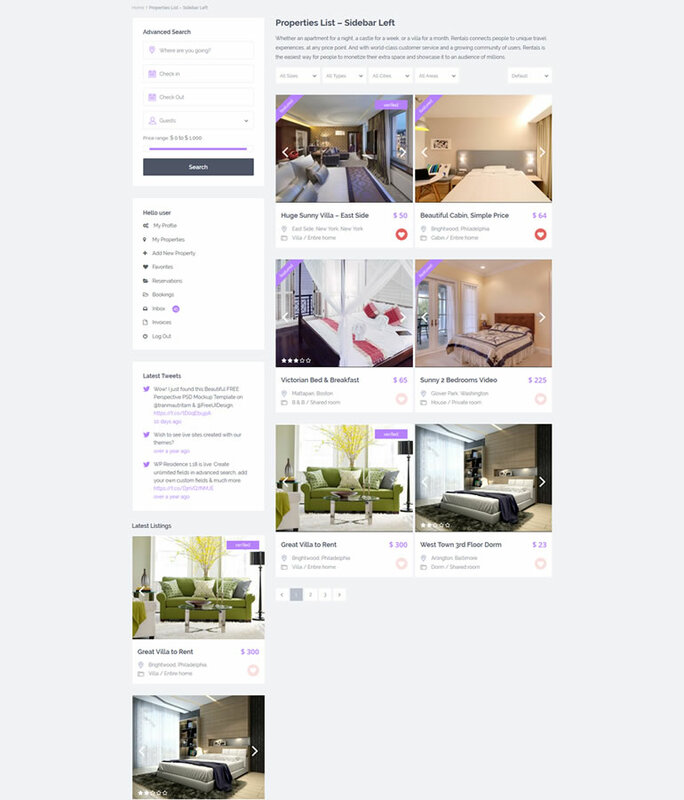 Rentals theme offers 2 design variations for the property page, and each highlights the best of your properties and the booking form from the first glance. A balanced design, with the most important elements designed to catch one’s attention quickly. This type starts with a full header image and continues with the rest of the property details. 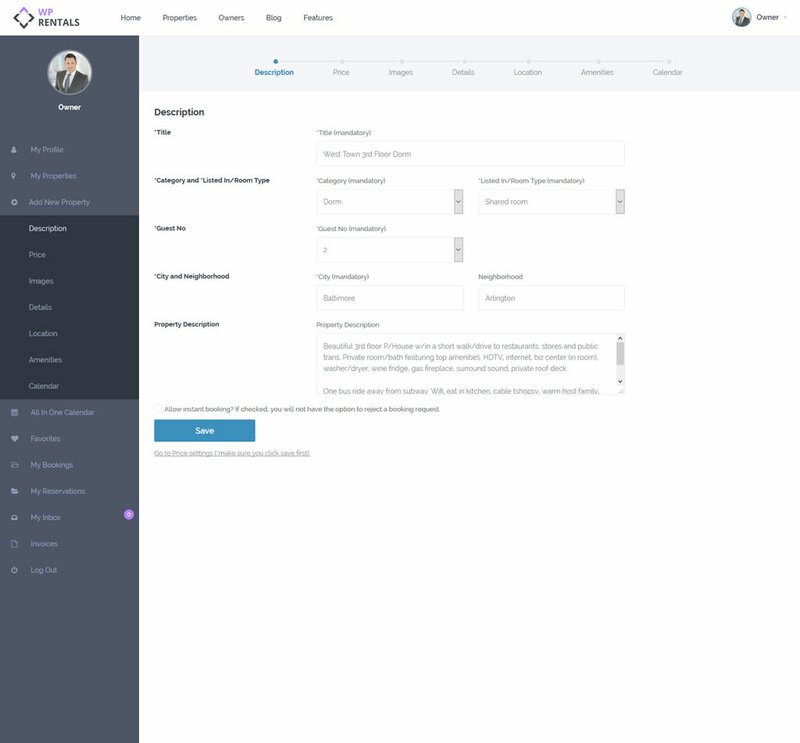 The booking form is positioned on the sidebar, and users can easily register/login to send booking requests and private messages. 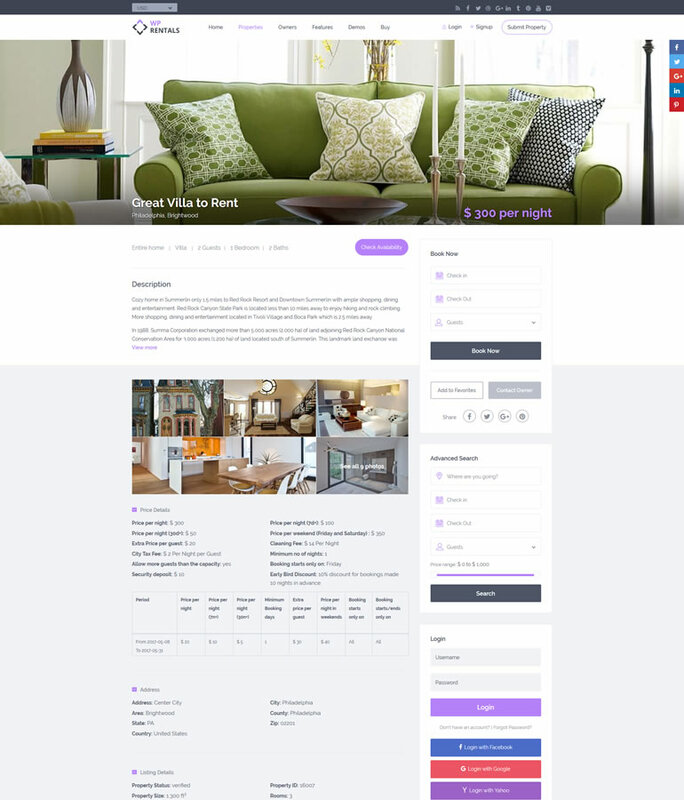 A slick design variation, with a classic design for the property slider that shows in the page content. The booking form and the contact elements are listed first on the sidebar, as they are easily accessible by users. The owner contact details show next to the booking form, and you can add other extra widgets of your own right after them. You can add your own custom fields to show on the property, and they list under Property Details, after the theme default fields. You can add dropdown, text, number and date format fields. In theme admin, you can set your own list of features and amenities to be available for your properties. You can also choose to show all features, or only those checked as available. Your visitors can save a property as favorite and check the property details later on. This feature is available only for registered users, and they can access the property from a dedicated page in their user dashboard. You can set custom price details for specific periods, and these details will show in a dedicated table. This system ensures visitors can easily spot special prices by night, by weekend, by guest and so on. 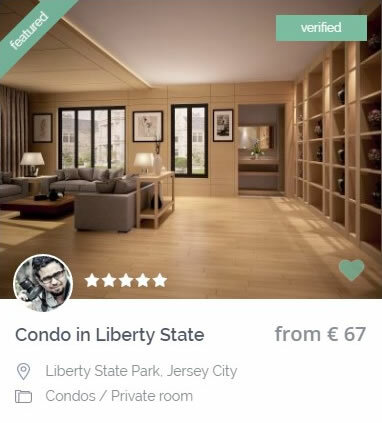 Share your property url on the most important social media accounts, Facebook, Twitter, Google Plus, Pinterest using the dedicated buttons listed next to the booking form. You can show specific Yelp nearby points of interests and their ratings in a dedicated section on the property page. Admin chooses what categories and if the distance is shown in miles or km. The property location is displayed on Google Maps, with a specific marker set from admin, and with nearby points of interest – such as restaurants, hospitals, supermarkets and many more. On the property page you can see the latest 3 similar properties from the same category, type, and city if such properties exist. Send private messages to owners directly from property page or from owner page. The messages can be sent as logged in users, or without registration required. The message will go to owner email and to his private inbox system. Admin can set to receive a copy of all notifications. 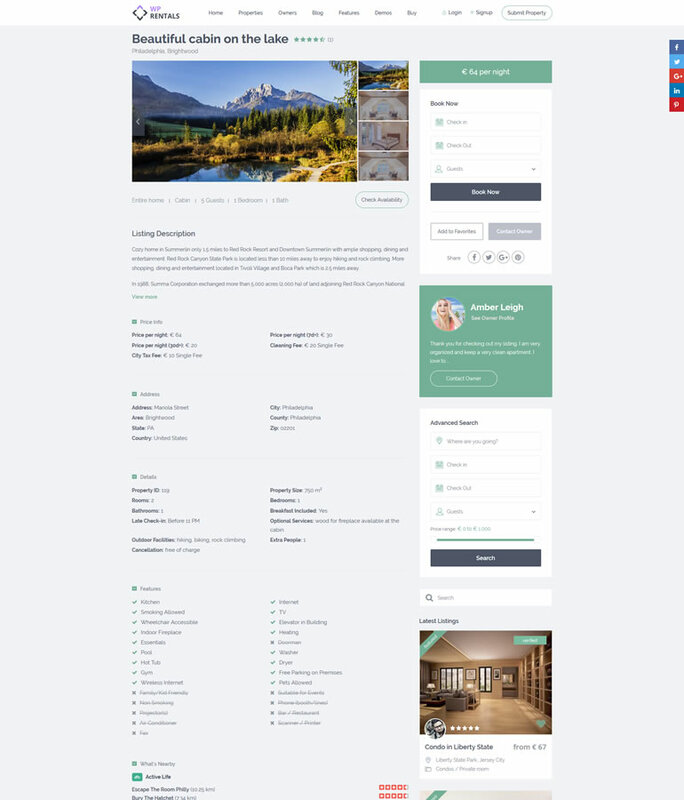 The property page has a built-in booking form that allows users to send booking requests based on owner’s selected price details: price per night, the price for the weekend night, price by night for 7d+ and 30d+ bookings, early bird discount, extra booking options and many more. The property shows the availability calendar in the booking form and as a separate section, with booked dates marked with a different color. The calendar number of months is set from the admin management area. Users will not be able to reserve dates that are not available. The property images are listed as a gallery or as a slider, depending on the chosen listing design template. When using mouse click over any image, a lightbox gallery pops-out, allowing users to browse through all pictures easily. 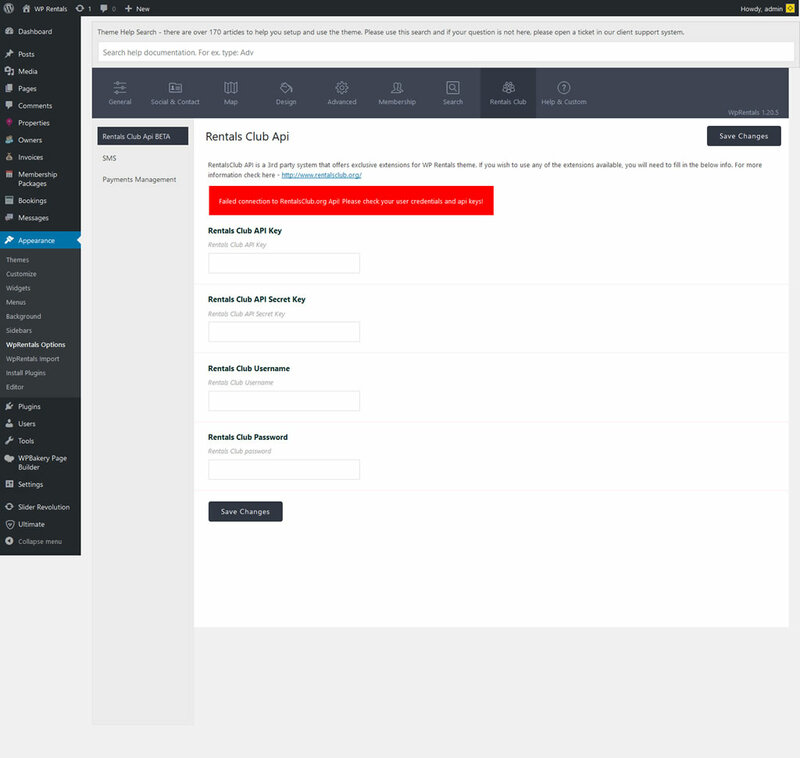 The modal can be closed with one click. Add your own listing pages and easily modify which properties to show, from which categories, how to position sidebar and widgets and more. 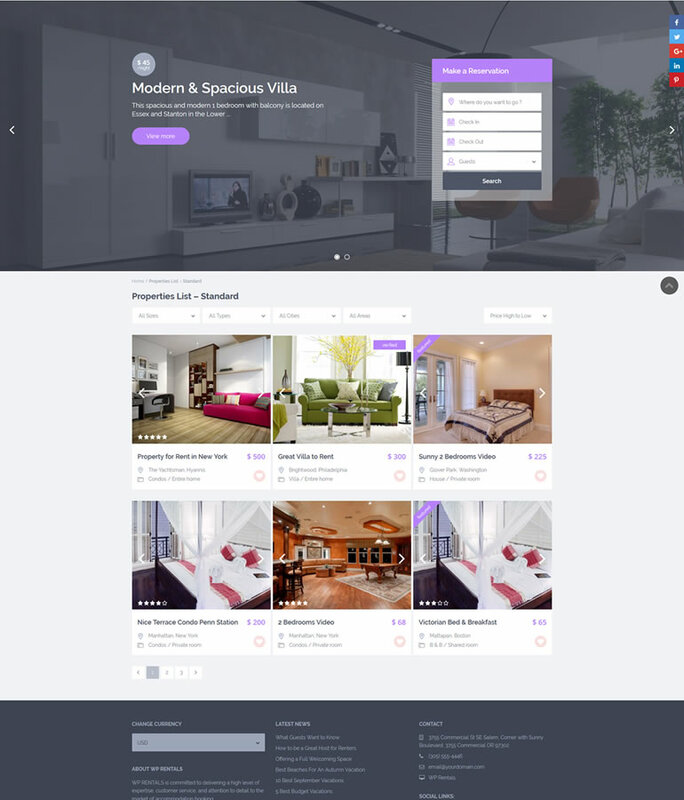 An easy way to showcase your properties, and allow visitors to find their favorite ones quickly. 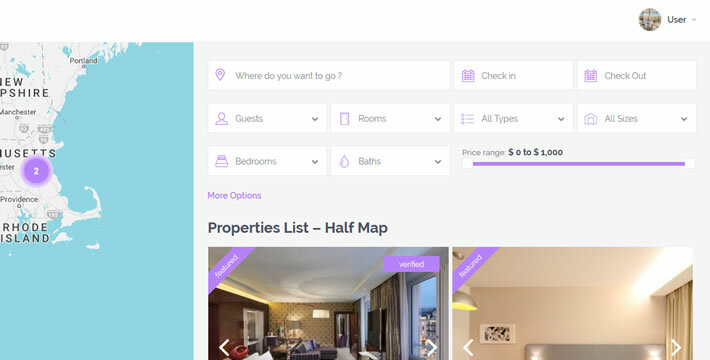 The page options include the possibility to select properties from specific categories, types, cities or areas and to list them in a specific order. The sidebar is configured by you, with available widgets. The properties list template includes specific AJAX fields for easy filtering of available listings. The properties pagination is managed by admin, where you specify how many properties to show per page. 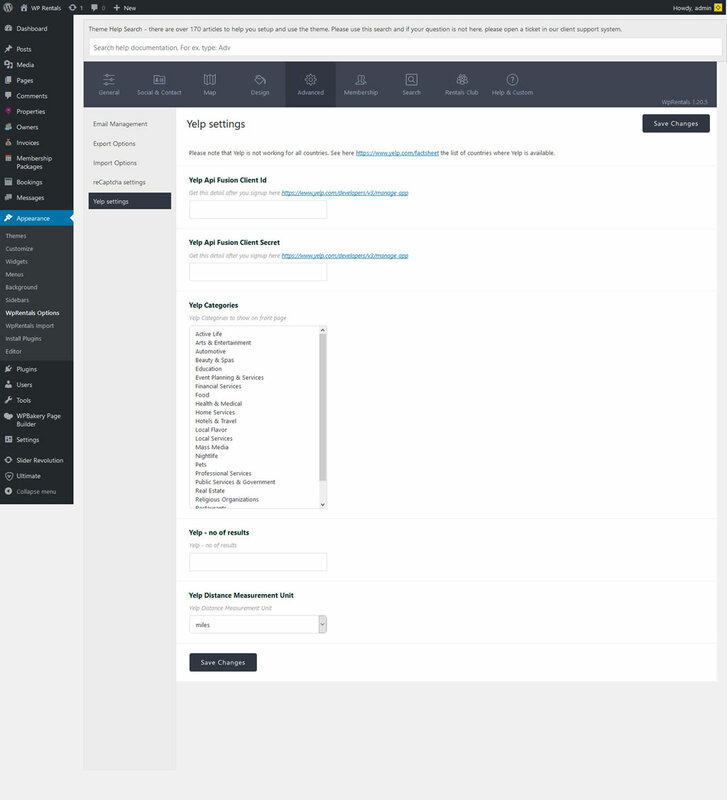 Sidebar position on the right is managed directly when creating the page. If you wish to go with a distract free property list page, the sidebar can be removed completely. You can also manage the header media for this page, add Google Maps, Revolution Slider, Theme Property Slider, a Video, a simple image or no header at all. 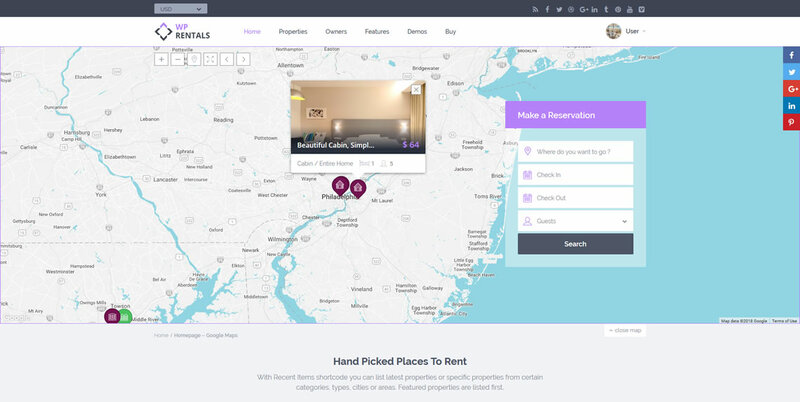 The half map style page includes advanced filtering options, including the possibility to search properties by specific features and amenities. The map pins and property list are synced automatically when using the filters. If enabled, users can also move the map to see properties only in a selected map view location. AJAX filtering allows users to search for specific properties and get results on the same page, quickly and efficiently. The theme comes with 2 design variations for the property unit card. The card includes the most important details, including an average rating, if reviews for that listing exist. 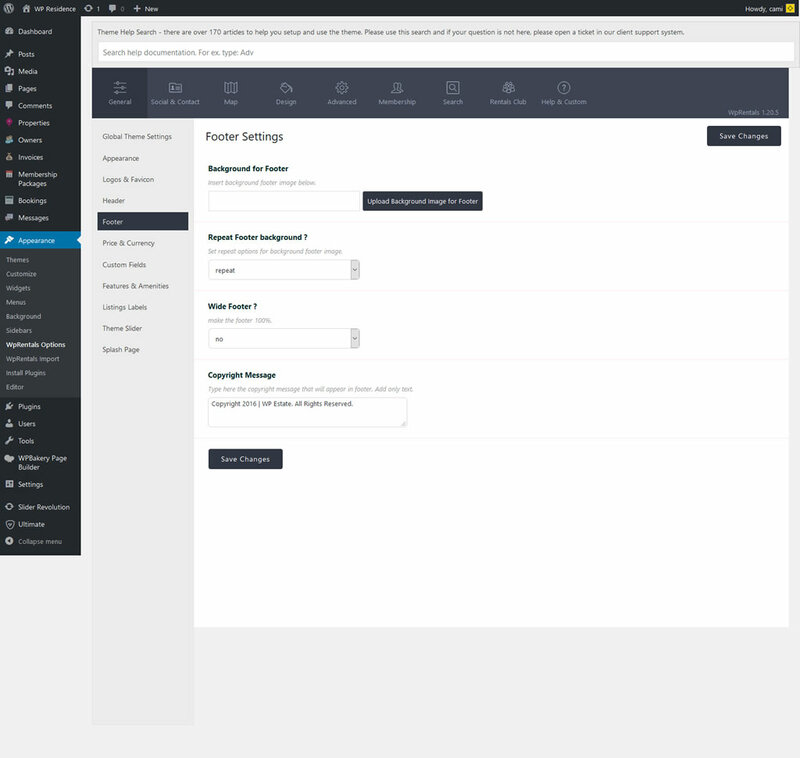 The Rentals theme provides advanced header design options, with color management, transparent header option, Mega Menu and more. 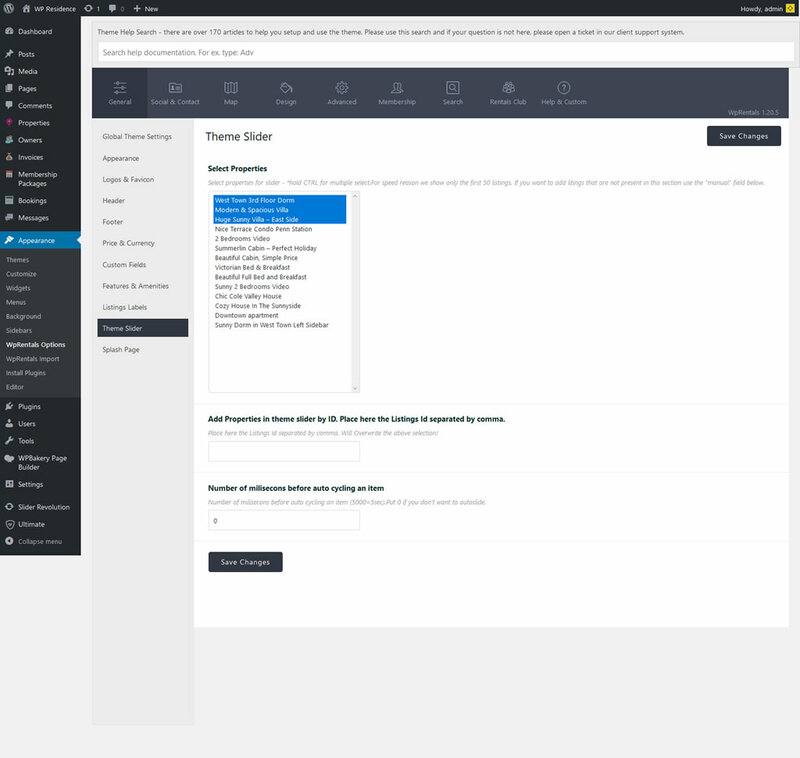 The theme supports 2 header types, with different logo position for each (left, right or center). Header type 1 has the logo inline with menu items, while header type 2 shows logo on a separate row. The theme has built-in Mega Menu options, with widget and font awesome support as well. Mega Menus are easily configurable from admin area, allowing you to add custom background images or set the number of menu columns to show. The theme is fully responsive on all devices. 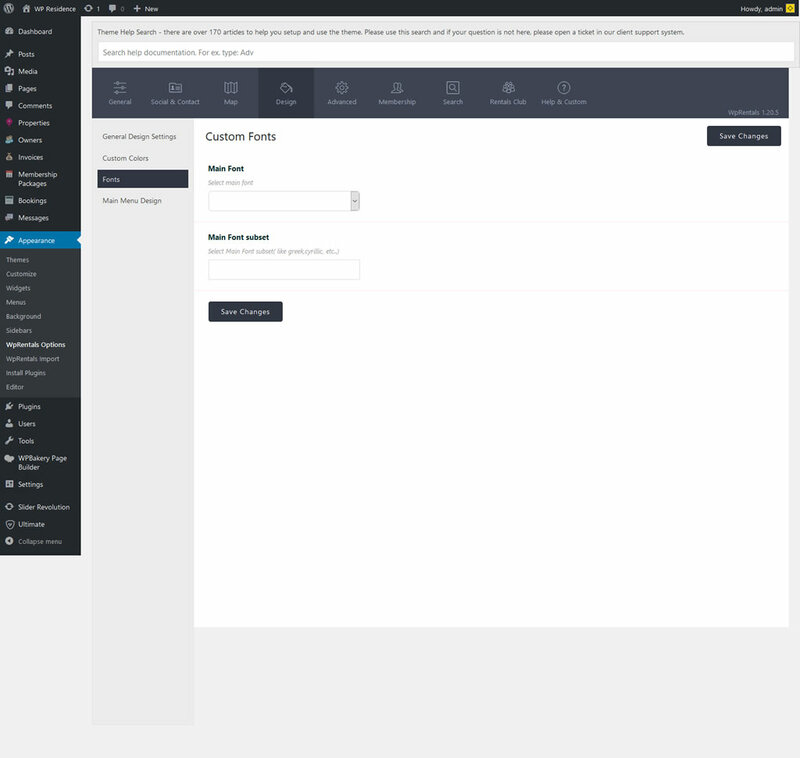 For the smaller screen resolutions, the menu area has a special mobile menu (fully adjusted from theme admin) and a dedicated user login/register area as well. 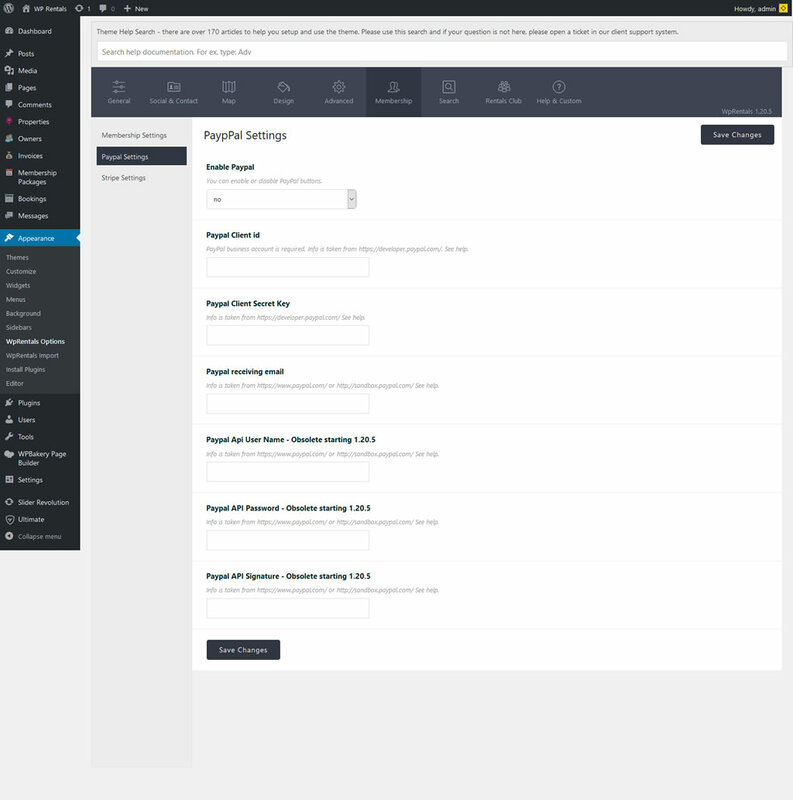 From theme admin, you can specify header and sticky header height, as well as header custom colors for background, text, hover elements. There are 5 hover effect styles to choose from as well. 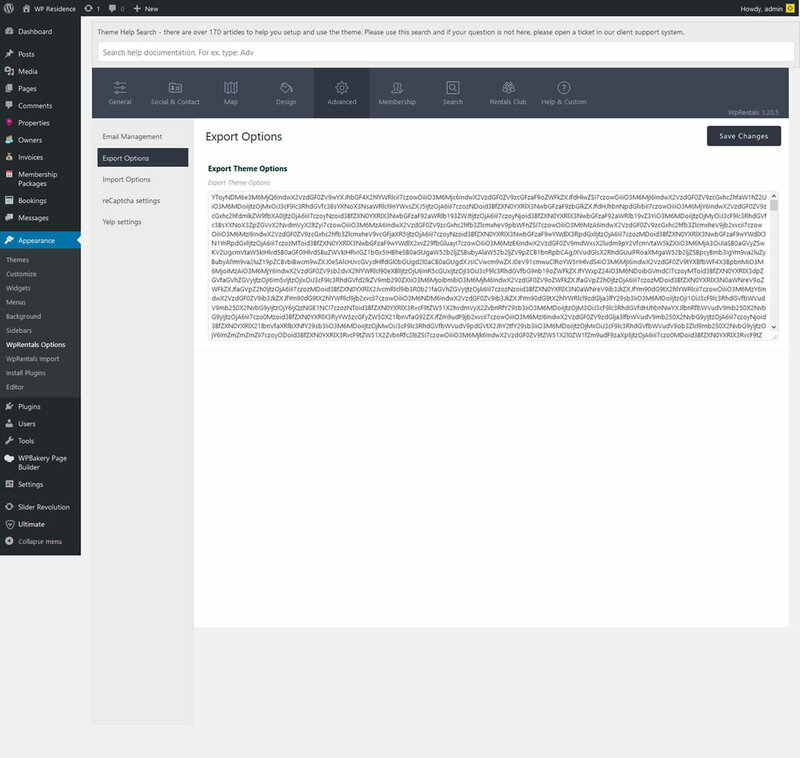 The header area can be set to show as wide as the max theme grid (1200 px) or to be 100% screen wide (as wide as the screen). For smaller devices, the theme supports a dedicated mobile menu area. The transparent header is in design trends nowadays, and as a best seller theme Rentals offers this option too. This option can be enabled just for properties, for all pages or for specific pages only. 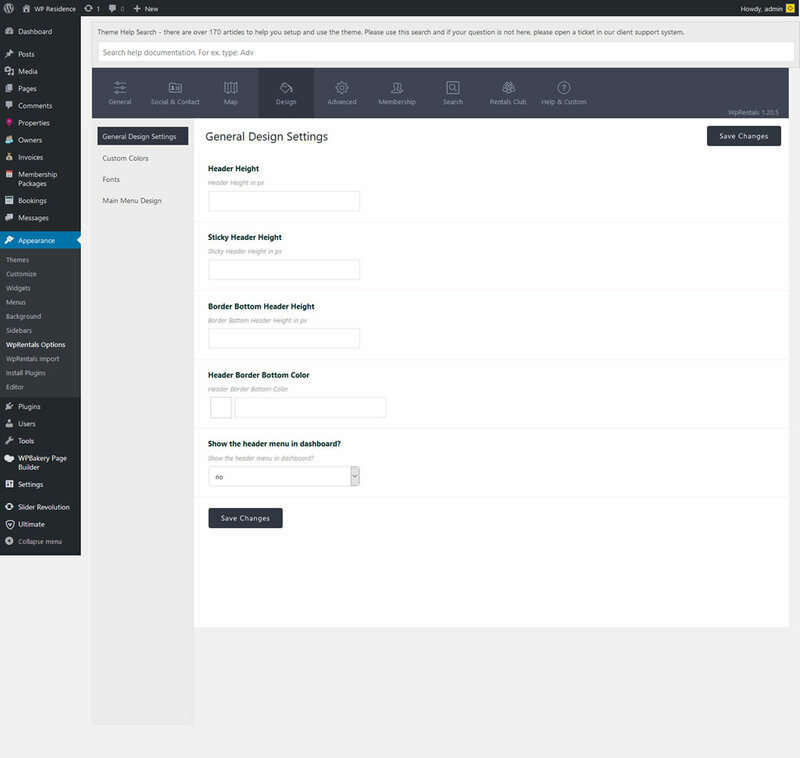 The Login / Register buttons can be removed from the menu area, as well as the Submit Property area. If enabled, login/register can support social login as well, via Facebook, Google or Twitter. You can enable/disable a dedicated top bar widget area where you can add different useful information for your visitors, such as social media accounts, your contact details, multi-currency widget etc. Build The Next Airbn.com ! 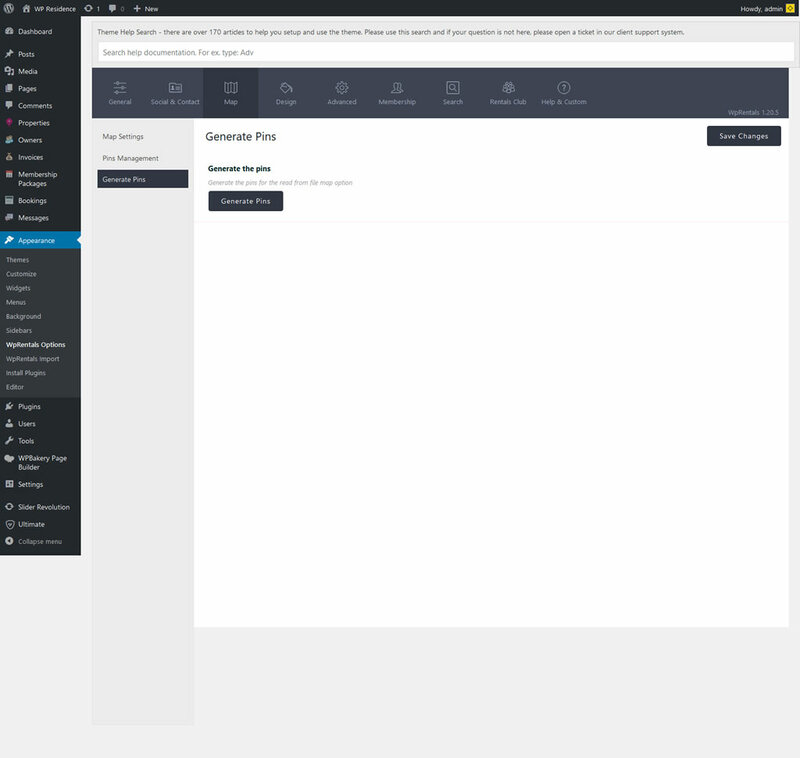 The header media section shows after the main menu and before the content area. It’s a fully customizable area where you can display different options. Check below for details. The WpRentals theme fully adapts to all screen resolutions, including smaller devices. It has a clean design which easily changes based on the size and capabilities of the device, loads fast and offers visitors a user-friendly mobile experience. Use any of the 3 splash page variations as an introduction page to your website. Video background is very popular nowadays, as it offers a unique and beautiful impression for visitors. WpRentals splash page supports video background, with custom titles, custom overlay color, and overlay transparency management. The splash page can be created with an image slider, uploaded from admin area. You can set the slider images, the slider transition time, overlay color and opacity, and your own custom text. Another option is to upload a single background image for your splash page and customize the overlay color, opacity, and your own text. Simple, easy and effective. Manage properties, bookings, reservations, and messages directly from front-end user dashboard. 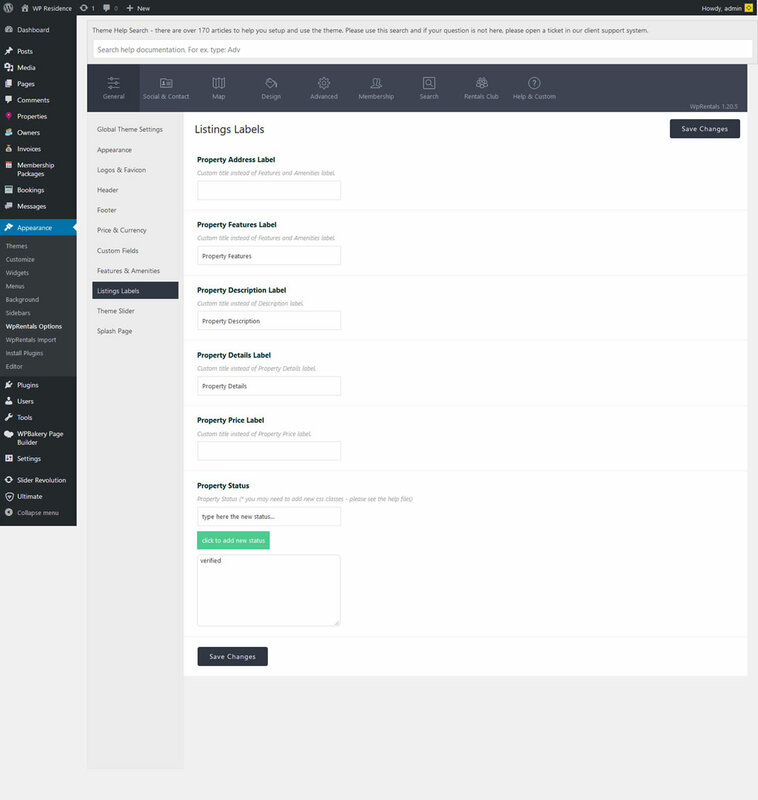 The theme allows limiting the options to Add Properties and Manage Properties just for specific users, which admin lists in the theme options. An easy feature to transform the site into a single owner platform. As admin you can enable the option to separate users on the registration step between users who just wish to book, and users who wish to book and rent (only these can add properties and have an owner profile created). Owners can have a dedicated “Verified” badge displayed if admin confirms them as verified. The verification process implies user uploads ID proof, admin receives a notification, checks and confirms the profile as verified. 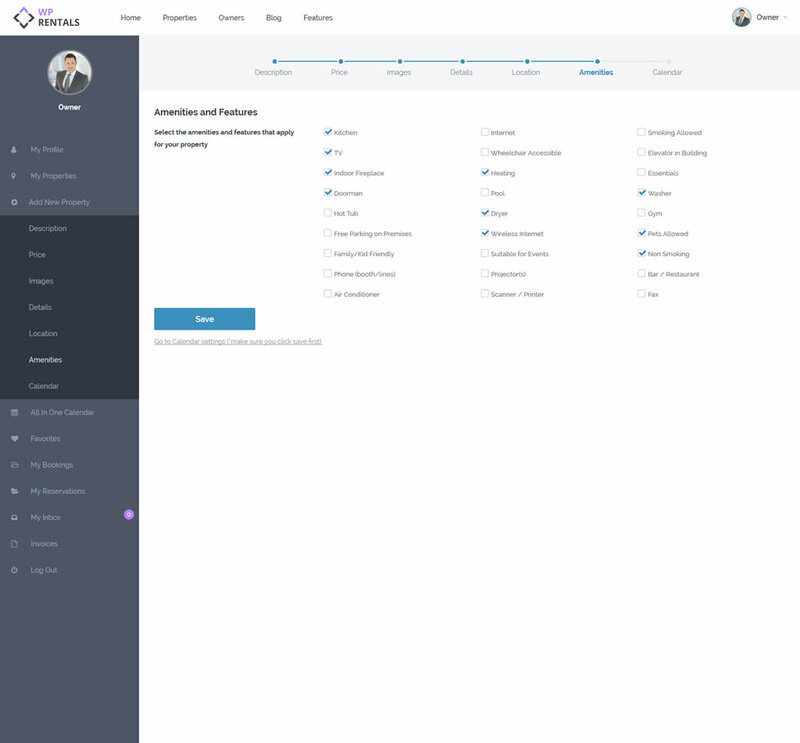 Owners must register from the front-end register/login options and manage their profile information from their own dashboard. They can add various details about themselves, including a personal photo to show on their profile page. 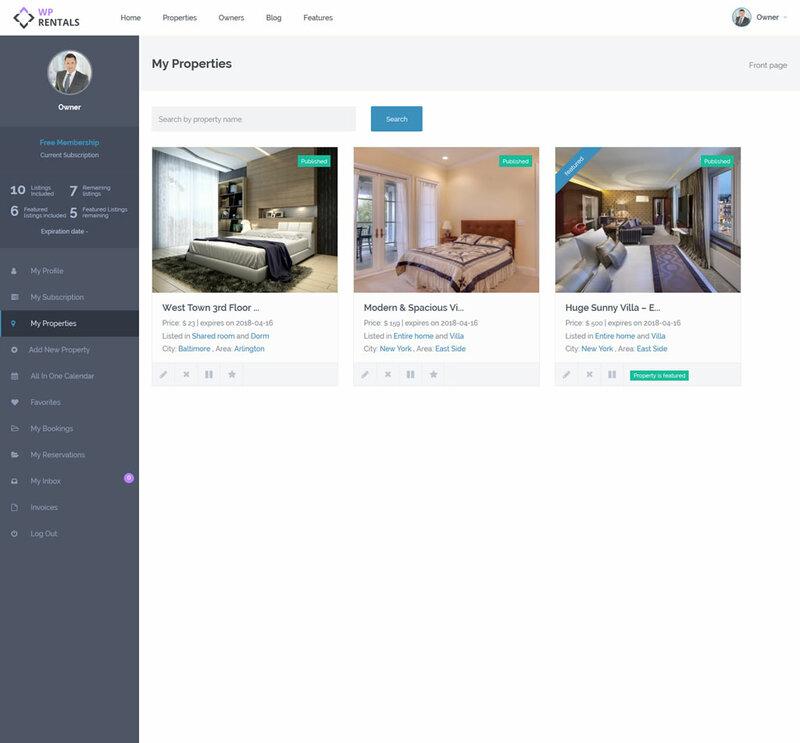 The property full management is done in this dashboard, including setting custom prices, managing ICAL feed calendar import/export, setting the property location, adding details, images, property features and more. Your own properties can be edited, disabled/enabled or deleted from a dedicated user dashboard page. My Properties list also allows searching for a particular property by its title. If you enable Membership based submission, users can change their package from My Submission page. This will list all visible packages, alongside with the payment options you enable (PayPal, Stripe or Wire Transfer). 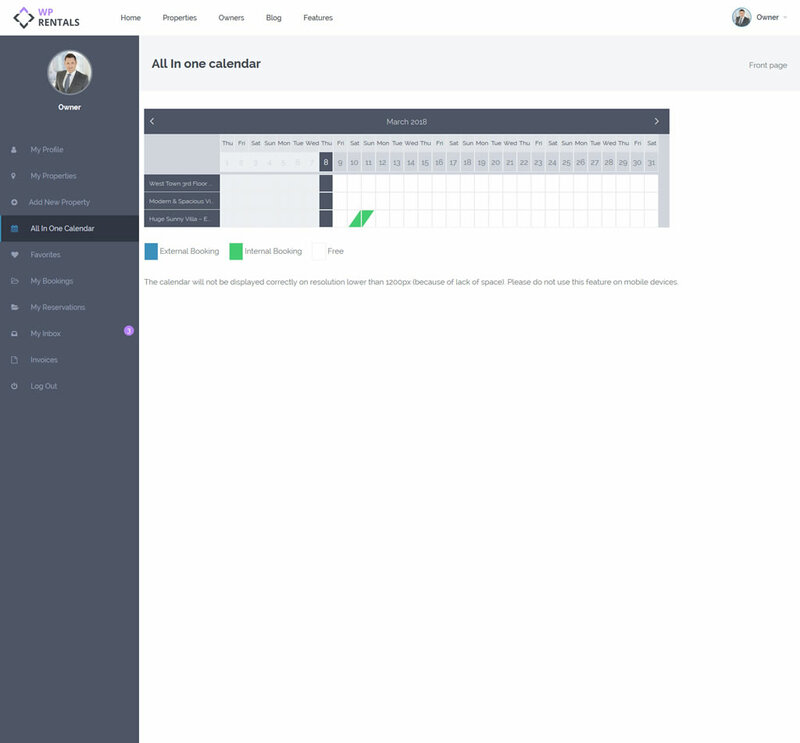 To easily manage manual bookings you wish to add as a property owner, you can use the edit property option or the All in One Calendar which gives you a list with all your properties, and the calendar availability for each. From My Bookings the owner manages his requests, approves or rejects them, cancels confirmed bookings (if required), and views confirmed booking details. When confirming a booking, the owner can add discounts or extra costs to the invoice generated. All the booking requests sent are listed on My Reservation page. From here the user can pay the deposit (if that is required for a booking to be confirmed), see his reservation details (if it’s confirmed), reject his request (if it’s not yet confirmed), and add a review after the booking period ends. The theme allows users to send messages to each other through a private message system. Login/Registration is needed for users to use the system. 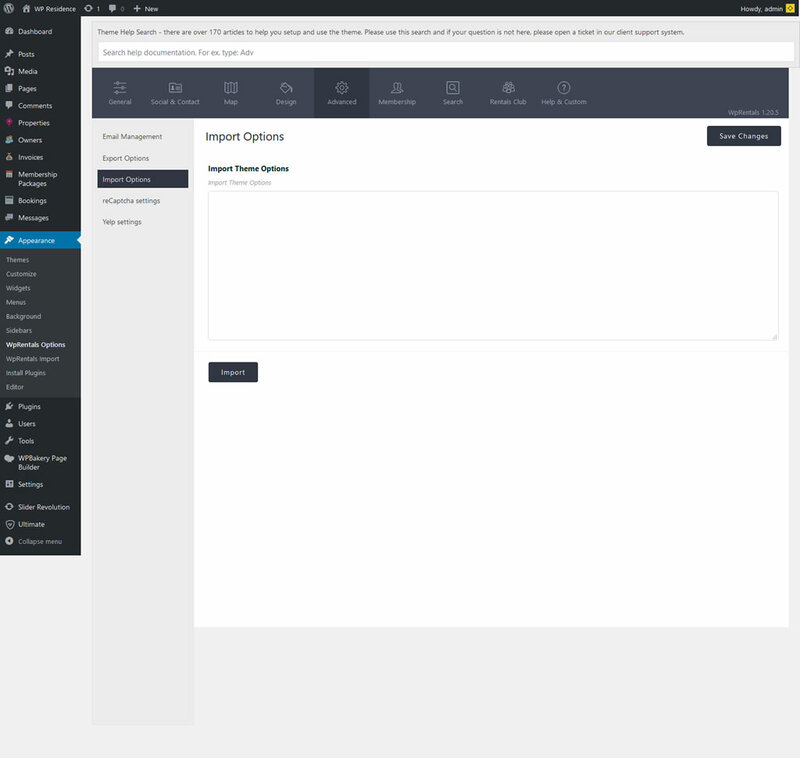 Messages are saved in user dashboard and admin can always access them from the backend as well. Users can save properties as favourite after login/register, and they can access them from their dashboard at any time. Favourite listings are saved from property page or from lists. Users can remove these properties at any time from their account. Monetize the theme and transform your business into a profitable one. Accept payments via PayPal, Stripe or Wire Transfer. As a site administrator, you can charge a service fee for every confirmed booking. The fee can be set in % from total booking or as a fixed fee, and it deducts from total booking value. If enabled the fee must be paid before booking is confirmed. Owner contact details are hidden until booking is confirmed. Deposit value is set in admin area as % or as a fixed value and applies to all bookings. The deposit value and remaining balance will show in user dashboard for each booking/reservation. Remaining balance can be paid through the theme (optional) and a reminder is sent automatically 3 days before booking starts. If you wish to charge users for allowing their properties to be published, that is an option in WpRentals theme. You can enable Paid Listing and ask for a fee for listing to be published, and an additional fee for the listing to be featured (featured means it shows first in all the lists). The payment has to be done one time only. Create different packages with specific no of listings and featured listings included, and a duration (in x days, weeks, months or years). Offer users a free membership with a specific duration in days. When free trial expires, users must upgrade to a paid package for their listing to continue being published. 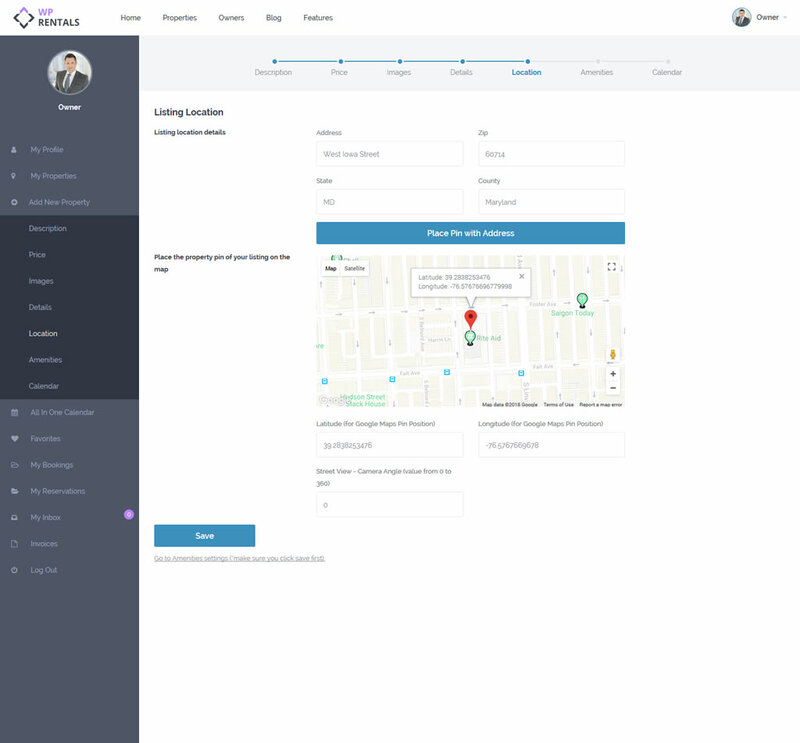 In user dashboard, there is a special section to see Invoices generated when confirming a booking request (an invoice is automatically issued as well), and when buying a membership package or a paid listing for submitting properties. These invoices can be filtered by date and printed as well. You can set the currency for the payments processed through the website from a dedicated drop-down that lists all currencies supported by PayPal or Stripe merchants. If you choose Wire Transfer as a payment method, you can add any currency of your choice in theme options. 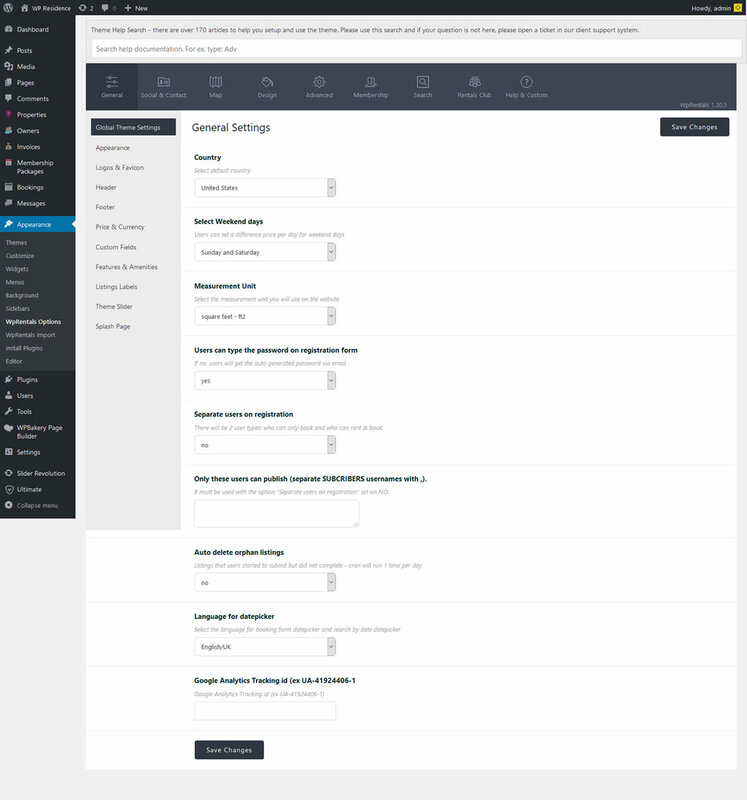 The theme works with recurring membership packages (used for property submission). The recurring checkbox is available to users when upgrading their free membership to a paid membership package. If checked, recurring payments are processed automatically on the paid package expiration date. With membership based submission activated, a free membership is given to all new registered users. You can set the no of free listings and featured listings, and the number of days for each free listing to stay published. Expired listings are not visible in front, but show in the user account. The theme supports Stripe payments, which is a credit card payment processor. As the site administrator, you add your own Stripe account API details, and payments will automatically be processed to your Stripe account. 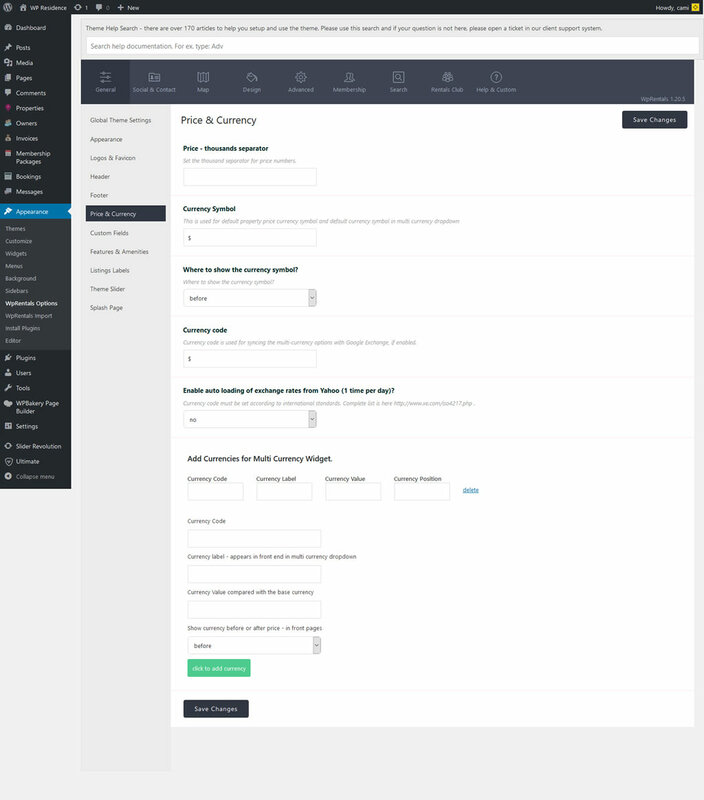 PayPal is another popular merchant which is included in the theme setup. Simply add your PayPal account API details and you will start receiving money in your account using regular or recurring payments. You can receive money using Wire Transfer (offline payments). Users can send you the fee they have to pay in your bank account, and as administrator, you manually activate their purchase after you confirm payment is received. As admin, you can manage new property submissions as you desire. You can set the theme to automatically approve new listings (and if you enable a payment system, this happens only if payment is received), or you can do manual approval. Allow users to register using Facebook, Google or Yahoo from the Login or Register forms. These options can be easily enabled / disabled from wp-admin. Set your Facebook API and you’re ready to use this option. Facebook login automatically redirects users to their profile, which includes their Facebook email, first name, and last name. Yahoo login works simply by enabling this option from admin. You can turn it on/off at any time. Set your own Google API, activate the login option and you’re ready to go. The Google login system will include in user profile his first name, last name and google email on registration. Any of the social login options can be enabled/disabled at any time from theme options. 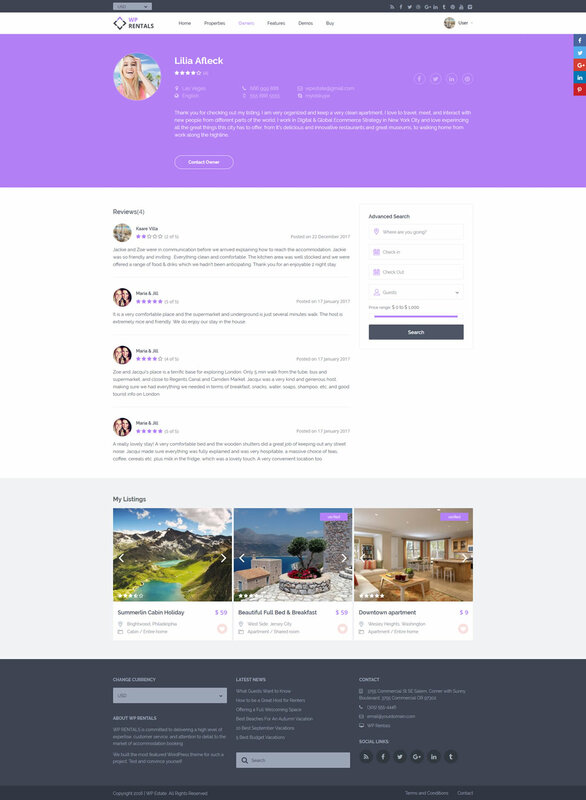 Owners profile shows all their properties, reviews and contact details, and contact info is visible only for users who have a confirmed booking with that owner. 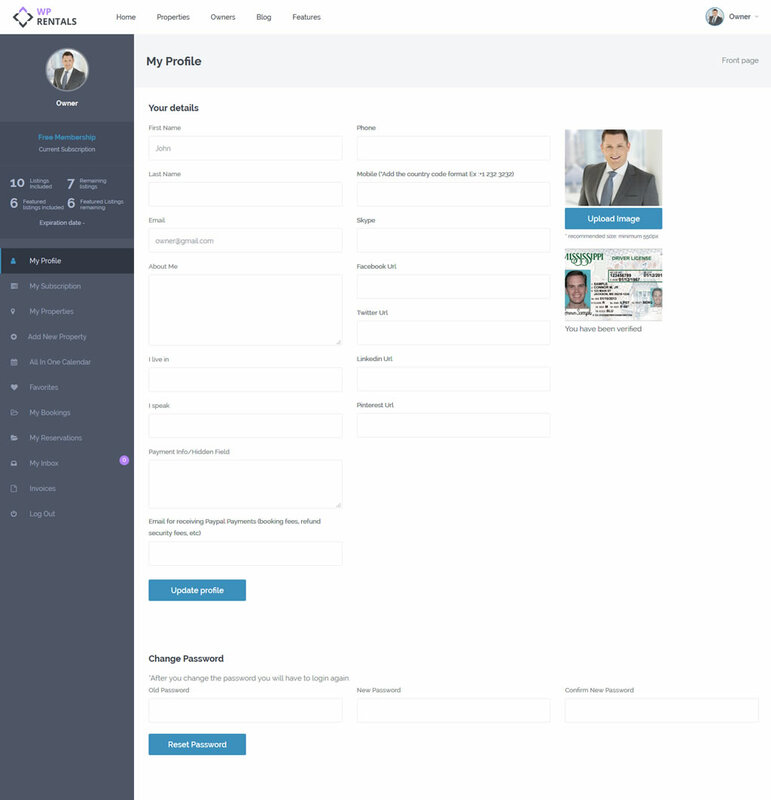 Owner profile page is created automatically when a new user registers on the website. 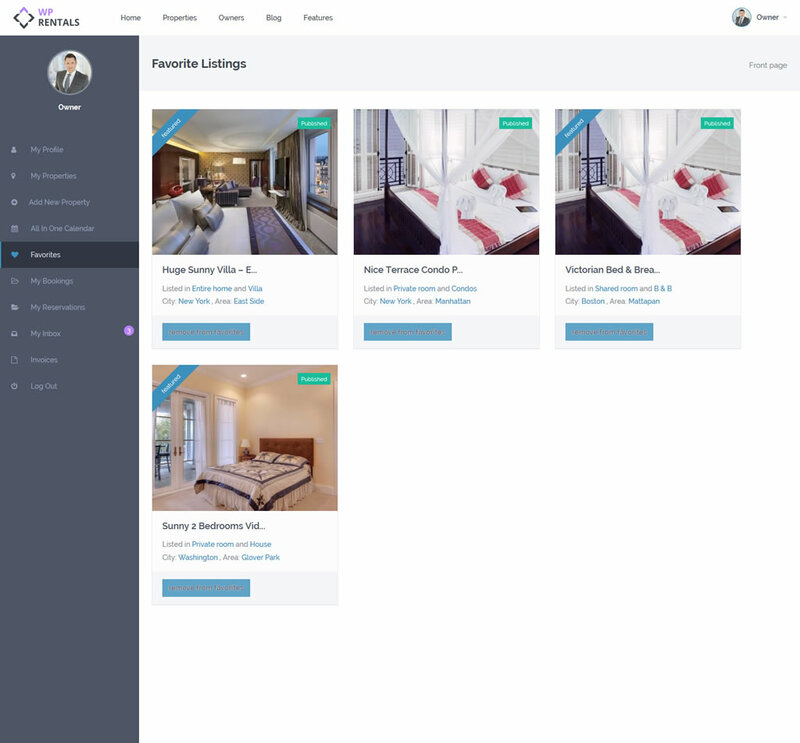 Users can check owner profile from the property page he owns, or from owners lists. 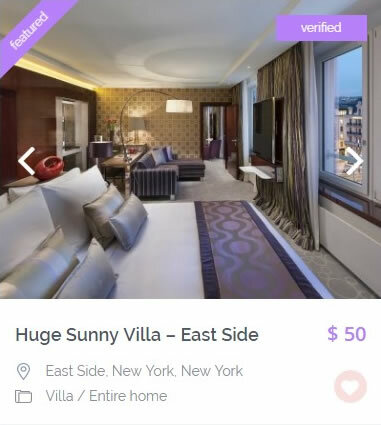 Owner contact details stay hidden for users accessing his profile and show only to users who have a confirmed booking for at least one of his properties. Send private messages with a dedicated contact owner form which is accessible only to registered users. The messages go directly to owner dashboard. An email notification about a new message is sent to his email. Admin can choose to separate users who wish to book and users who wish to book and rent on registration step. 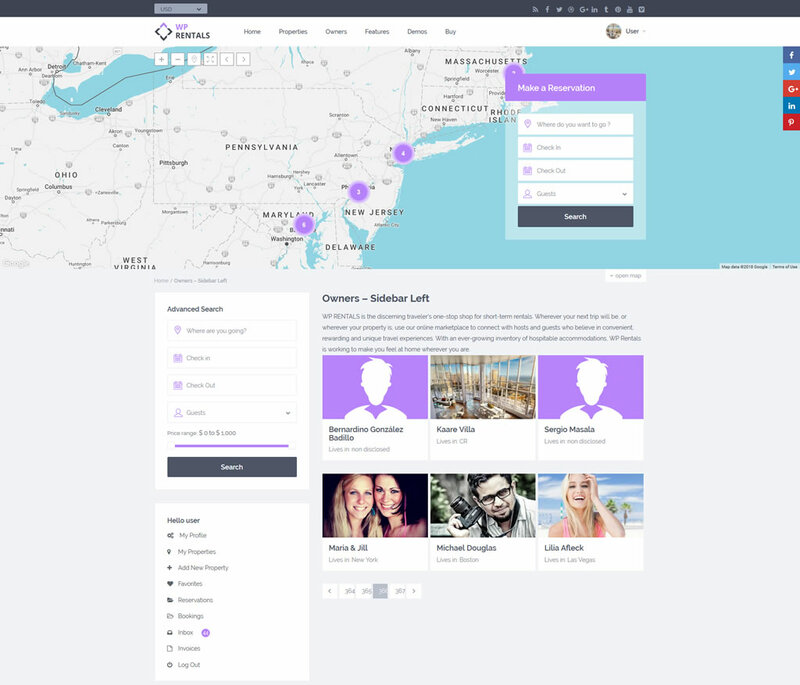 Only users who select they wish to rent will have their own owner profile created. Owners can have a Verified badge showing on their profile. This is enabled by admin. Owner will have to upload an ID scan to his profile for admin to check before he adds the Verified tag. Wish to show how many owners prefer your services? As Admin you can create a page that lists all the owners registered on this website. This is managed from theme admin – pages. If you wish to select specific owners to highlight on the homepage or any other page, you can use a dedicated shortcode named featured owner. Owner profile features a modern design, highlighting the best of owner details from the first view. You can check owner details, properties and the reviews received from users renting any of his properties. Owner list is a page you can create to list all owner profiles registered on your platform. 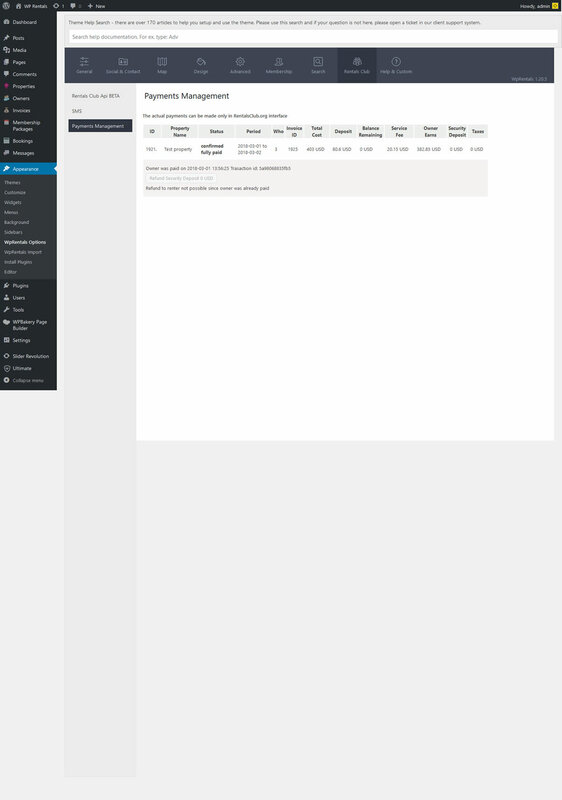 As page options, you can select where to position sidebar and which sidebar, and what type of header media to show. Start Your Vacation Rental Website Today! The theme options are easily managed from the backend, from design to property custom fields, google maps and more. Check the screenshots for detailed information. You can set from admin which are weekend nights, how many months to show in the availability calendar and how many guests to show on drop-down. You can set deposit value, service fee value and your admin payment accounts, and more. You can easily change the logos (including retina versions) to your own. The colors are easily modified as well. 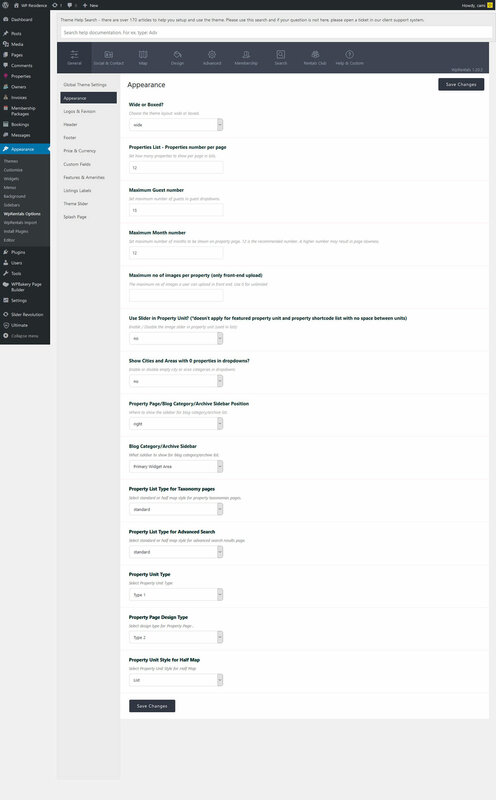 Additional to these elements, you can also change design version (boxed or wide), footer and header display, and more. From theme options you can add more custom fields for properties (dropdown, text, number or date format), you can add your own features and amenities, you can manage property status labels, the default currency displayed for listings, and more. Easily change the Google Maps colors (add your own theme from snazzy maps), change the map default location & height, when or if to display the property clusters for listings in proximity, manage property markers, and many more. You can choose between 2 search design variations, vertical or horizontal. You can manage the search display over different header media options, you can add which features and amenities to show in the half map style search, etc. 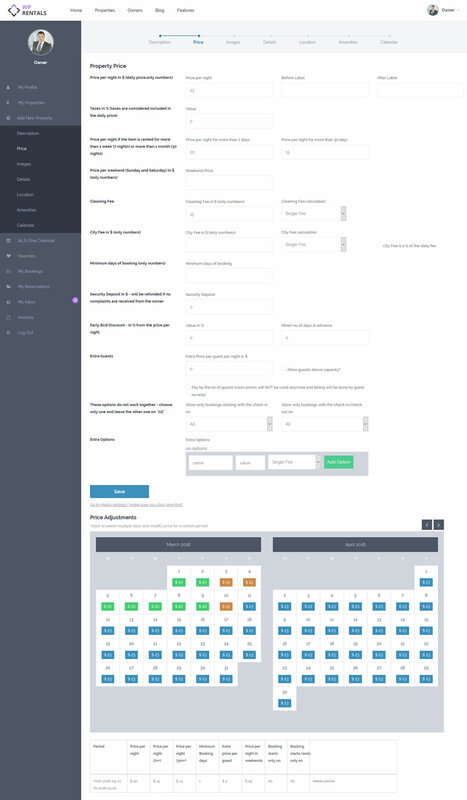 The theme works with default email notifications that are sent to users when doing different actions (send a booking request, confirm a booking request, etc). 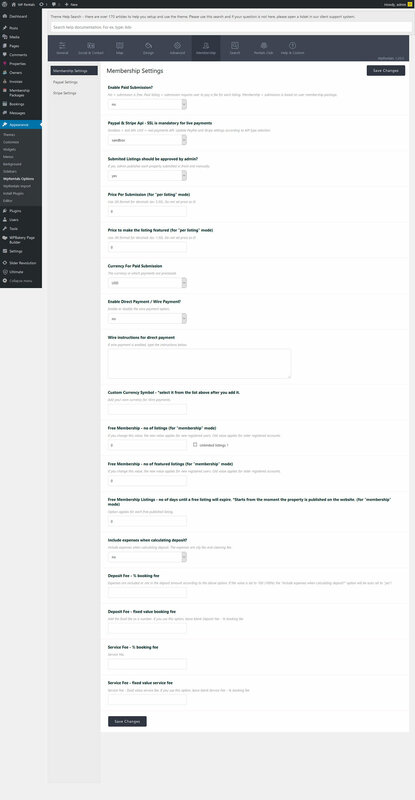 These emails are managed from theme options, where you can change the text to your liking. You can export full theme options and import them in a different WpRentals installation, without having to do a full demo import/export. Just copy/paste from theme options as instructed, save and the process is complete. If you would like to show Yelp – Nearby Points of Interest for each property, is easy to do that. Just add you Yelp API, select which categories you would like to show, how many items per category and if you wish to display the distance in km or miles. 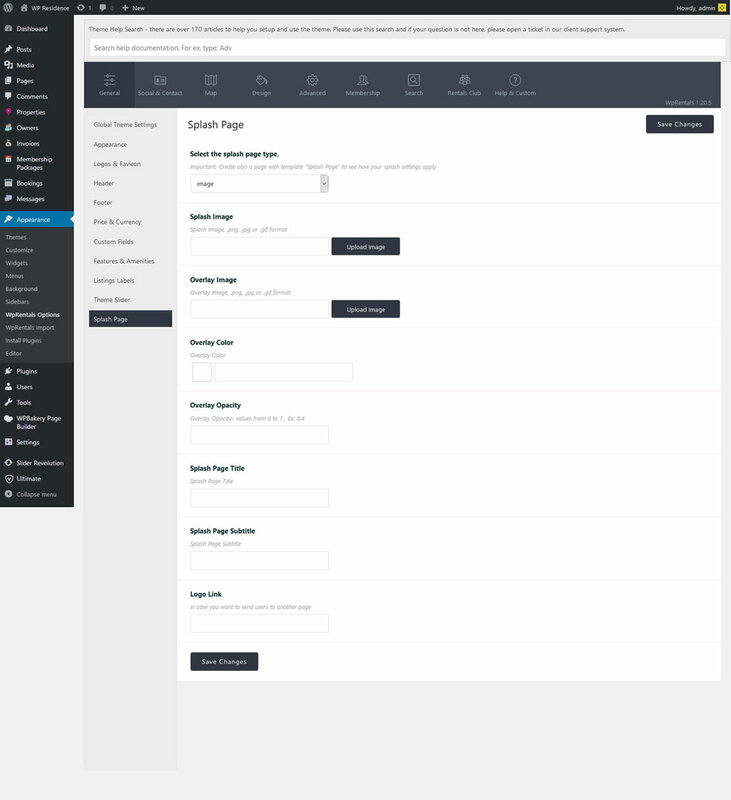 The theme includes various shortcodes to design your pages as you wish. 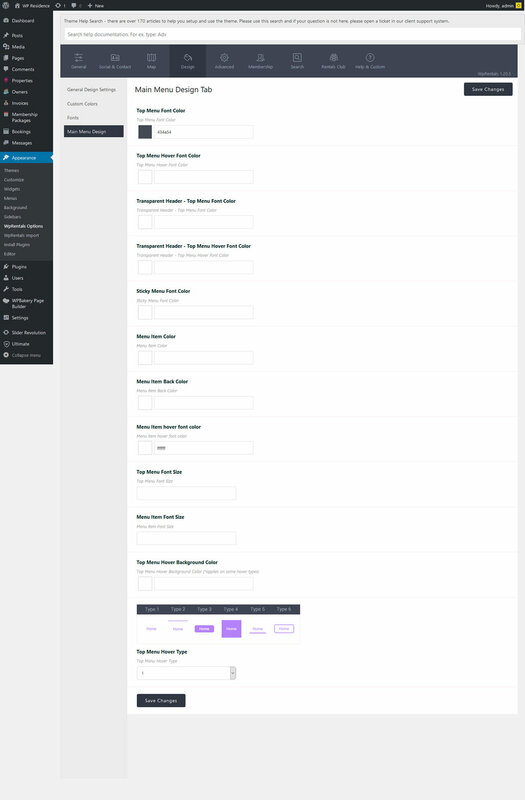 On top, you get many other shortcodes from Visual Composer plugin, included in the theme package. There are specific shortcodes designed to help you highlight the properties published on your website. 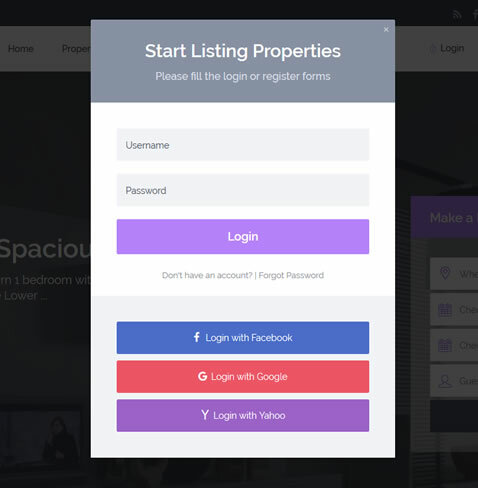 You can use a list or a slider, or add featured properties one by one. You can highlight the best of your blog using a list, a slider, or simply mention the most interesting articles using the featured post shortcode. You can use various shortcodes to display specific cities or areas from your published properties. You can add a featured image for each city, which will be used when displaying them in the lists you create. The theme includes 2 shortcodes for login and register that you can use on any page you create. This comes in handy for clients who don’t wish to use the header login/register system. Use this shortcode to highlight specific properties on the homepage or any other page. It’s a great way to promote best deals, most popular listings, etc. You can list specific properties by categories, types, cities or areas (in any combination). The shortcode allows you to select also how many listings to show and how many per row. You can choose to show just featured properties, or all, in random order or default order (which is featured first, and by publish date next). 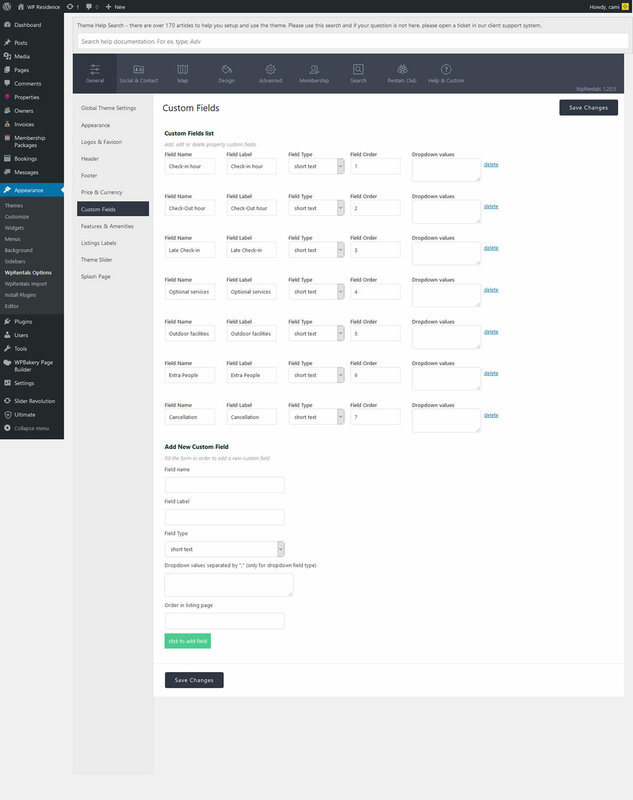 Create beautiful pages with the Recent Properties shortcode second modern design variation. You can choose which properties to list, by selecting specific categories, types, cities or areas. If you wish to showcase only specific properties in a list, you can use this shortcode. It’s the same as the recent properties shortcode, but you manage which properties to show. If you wish to highlight a specific owner profile details you can choose to add the Featured Owner shortcode. The shortcode shows owner profile image, full name, and a link to his profile page. The slider can show properties from your selected categories, types, cities and area. You can choose how many listings to present, and the slider transition period. Present the best cities or areas using the Places Shortcode. You can add a featured image for each city/area, which will be used when listing your chosen categories. If you wish to highlight a specific city or area, you can make them stand out with this modern design shortcode, which can be used on different columns and rows. Add different testimonials gathered from your clients to build trust when new visitors arrive on your website. 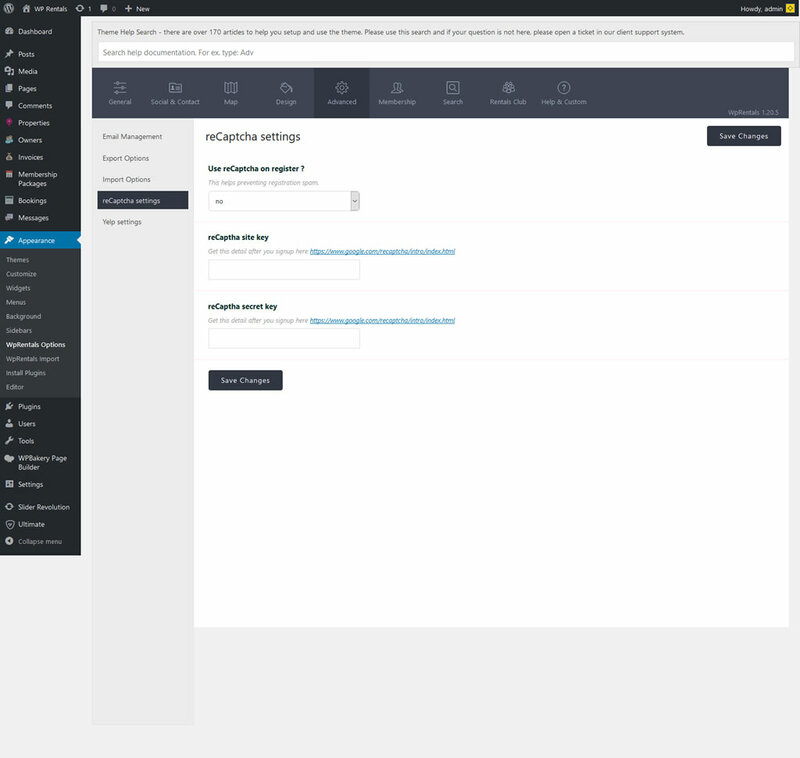 You can easily add the shortcode on any default page you create from admin. 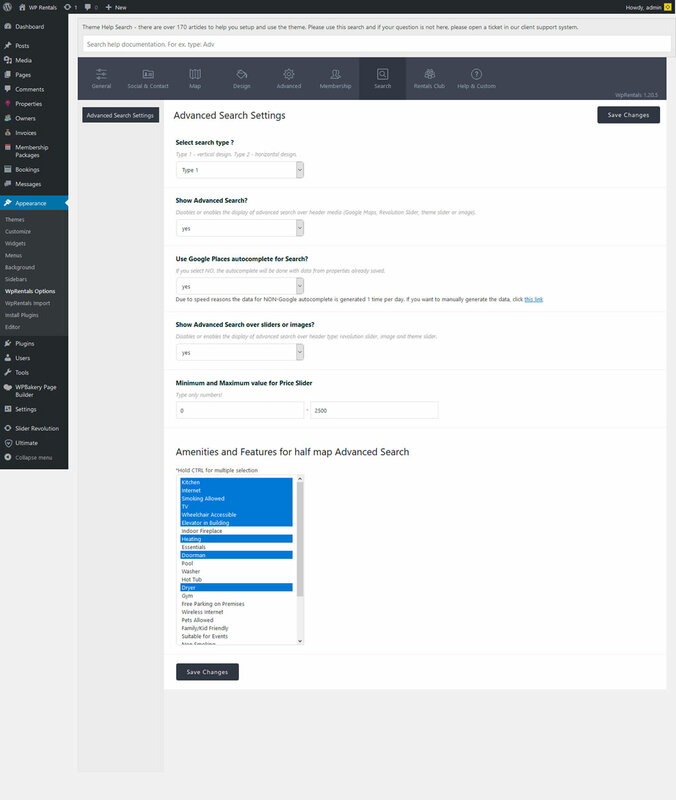 The theme Advanced Search has a shortcode version, that can be used on any page you create / design. It’s a useful tool for your visitors to find properties that interest them and start sending booking requests right away. 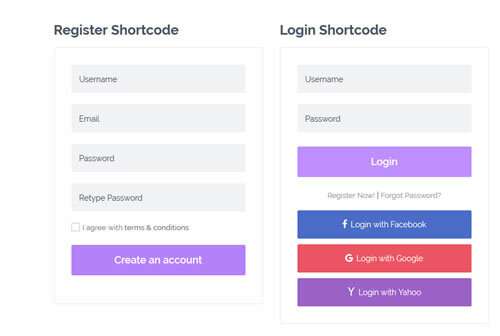 If you wish to create a dedicated page for login/register options you can use the two dedicated shortcodes available in theme admin.